If you don't know who Bruce Campbell is then shame on you! I'm not your father so you go and do the research yourself using Google and find out. I will only say this: He is an actor that has no equal. Really. I am not kidding. 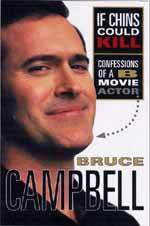 Over this past summer Paul notified me that Bruce Campbell had written an autobiography. The idea of this naturally excited me. I waited for Paul to finish it but that only took about a day. I was slightly more leisurely in my approach. I took my sweet time milking it for all it was worth. I stretched the book out reading one chapter at a time for almost a month. It's great because when I was about fifteen I read both The Stand and Les Miserables in under a month's time. However that was light reading and didn't command the full attention I devoted to Bruce Cambpell's piece If Chins Could Kill. Hey, he called it a "piece" himself at the book signing. The book itself is wildly entertaining and contains many hilarious stories from Mr. Campbell's brilliant career. You can--and should--buy the book here. Paul gave me a great tip for how to read the book. "Nate, just imagine all the words you're reading being spoken by Bruce Campbell." And that's exactly what I did. I must admit that I may not have thought of that simple trick had Paul not told me. Had I not know that I may have only enjoyed the book 50% as much. A few weeks ago I got an email from Laura stating that Bruce Campbell was going to be coming to our local library for a book signing. With little time to plan we were able to get all of the North American Redcloud Brothers (sorry Yahtzee) assembled. We all met roughly an hour before the signing. I told Jacques to meet us there at 6:00 and he showed up at about 5:30 so I knew he was excited. It generally takes Jacques upwards of two to three hours to travel the thirty-five minutes from his house to Providence. On the trip Jacques unleashed a banana from a brown paper bag and wielded it as if it were a weapon. "I brought a banana," he proclaimed. "For protein." When we got there we were shown a brilliant little documentary about Fans that Bruce Campbell directed and starred in. Then Bruce Campbell walked out onto the stage saying: "Alright, enough of that nonsense!" To which he received a wild round of applause. He read from his book, told jokes, made everyone laugh a bunch, took some questions, gave some question askers a much needed ribbing and then allowed everyone to come up so he could sign their merchandise. In line I began to get nervous. I was the only person in the entire line who wasn't holding a book since I had read Paul's copy. I began to feel very self-conscious about going up there with just a picture of him from the local TV paper when he was in Herbie the Lovebug. I quickly snapped into action by begging for money from Jacques and Paul and buying a book. Now he began calling us up and I felt slightly more legitimate. Here's a brief transaction of all the insane and annoying things we asked Bruce Campbell to sign or do. This gives you an idea of how nice a guy he actually is. Paul: Will you sign this book? Paul: Will you pose with this Lance and Eskimo mug? BC: (looks at mug) Lance... Eskimo...? No one that's ever seen or heard of Lanceandeskimo.com for the first time has ever not said, "Lance... Eskimo...?" Exactly like that. BC: Sure I'll pose with the mug. He and Paul pretend to be fighting over the mug but by the time I get the picture taken Paul looks bored. Bruce Campbell, on the other hand, never breaks character. A true professional! Paul: Will you pose with the mug solo so we can put the picture on our website? BC: Sure I'll hold up this mug for your website. Me: Hi. Will you sign my book? Me: Will you sign this picture of you from Herbie the Lovebug? BC: Wow. You did some digging. He signs the picture and even draws an arrow to himself so that people seeing it will know which one is Bruce Campbell and not assume him to be either the woman or the Volkswagen. Bruce Campbell points to the camera and takes a picture where he shows the true scope of his acting talent by pretending he's happier to be seen with me than I am to be taking a picture with one of my heroes. Jacques: Will you sign my book? Jacques: Will you sign my banana? BC: (without batting an eyelash) Sure, give me the banana. Laura: Will you sign my picture of Autolycus? Laura: Will you take a picture with me and all my "brothers?" BC: Sure get 'em all up here. We take the picture and thank him for his accommodation. "Whoa! Whoa! Where do you think you're going?" The thing about Bruce Campbell is that he makes anything he's in infinitely better. Christ, I even watched Escape From L.A. voluntarily because I knew he was in it even if his scene was only two minutes long. Although I already watched Hercules and Xena religiously, his presence made the experience all that more enjoyable. Meeting him and hearing him speak felt more like hanging out with an old friend than meeting some snooty celebrity. He did not make a stink about signing his books, memorabilia and even fruit. He truly appreciates his fans and shows it by not treating them like fans but rather like friends. 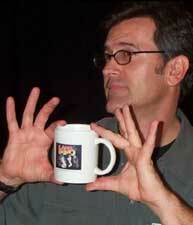 Buy Bruce Campbell's book and read it... you won't regret it!